Dubai Mehndi Designs: One can observe, Dubai exhibiting its style in the complete lifestyle of a person. The celebration of any event, occasion or function seems to be the most joyful when it is celebrated efficiently. Everything needs to begin in the proper manner and ends in such a way that it makes the event memorable for a lifetime. Right from getting ready from head to toe; it imbibes of hairstyle, designer dress, scintillating jewelry, beautiful makeup and the way you carry yourself. Well, this is what everyone takes care of. But Dubai, the Gulf Realm, stands apart from all. Dubai is a leading country with every day changing trends have added a significant beauty enhancing trick to their life which takes them to the peak of panache. Wondering as to what it is? Well, their beauty trick is adorning their hands and legs with henna or mehndi. Applying mehndi has not only become a part of the tradition of their festivals but has also become a mark of personifying their elegance. Dubai, the Gulf realm, bestows the henna lovers with a distinct style of mehndi patterns and designs which make them stand individually recognizable. 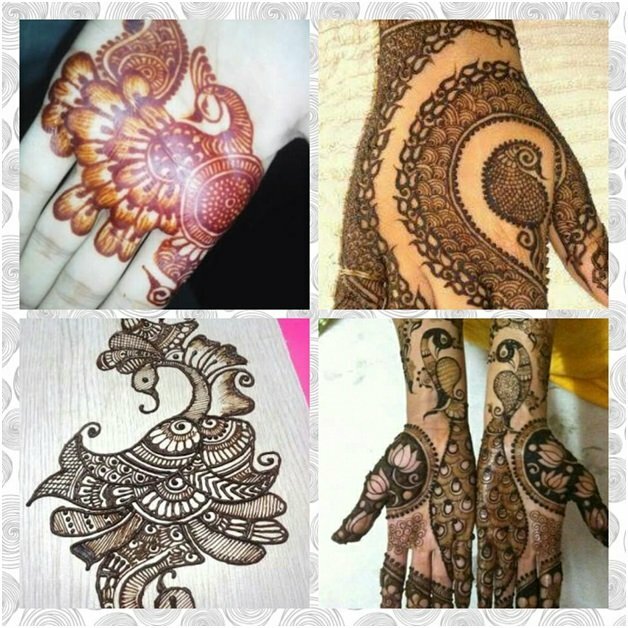 These designs are termed as Dubai Mehndi Designs, Khaleeji Mehndi Designs, and even Arabic Mehndi Designs. The best mehndi designs are said to be originated from the Middle Eastern countries, and Dubai is one of them. Take a glance at some exquisite collection of Dubai Mehndi Designs that comprises of various types of mehndi patterns. One of the unique patterns of Dubai Mehndi Designs is renowned for its single strand sort of pattern. In such a design, the wrist is the main attractive feature which is highlighted by applying mehndi in the form of bracelet pattern. One can also add an ornate string to elaborate the mehndi design up till the middle finger. The given designs are the best example of perfection; especially when you are preparing for the wedding of your friend or any occasional eve. Another Dubai mehndi pattern is the one which we see below. This is termed as Ornamental Khaleeji or Dubai Mehndi Design because this design serves as an alternative to jewelry. It is made in such a way that if you want your jewelry to rest for some time at home, then this self-ornamented designed Mehndi pattern will do the task for you. Such a model will compel anyone to keenly observe as to what sort of jewelry you are wearing and later on realize the tricky truth. This Dubai mehndi design is a perfect exemplification of circular motifs. It truly presents the taste and fashion of the people living in Gulf. The ornate circular saucer designed in the mid of the backhand is the main attraction followed by a bracelet sort of design over the wrist. The connection has been so well drawn that one cannot identify them as two different patterns. This circular exemplification Dubai mehndi design is genuinely an indicant of the festive atmosphere which is always present there. What more can define the celebration mood of different festivals celebrated in Dubai! The twist and the swirls like bangle have been given the shape of mehndi art. Depending on one’s choice, this mehndi design can be started either from below the elbow or from the wrist. Though it is not an easy task to lend it perfection yes, you can give a try. With the glitter of gold everywhere, people of Dubai love the sparkling taste of stones in Mehndi too. Thus, they have bought a unique twist to their mehndi patterns as well. The glitter powder and colored stones are used by them in their beautiful mehndi design to upgrade its simple look too shiny one. Sparkles & Stones UAE mehndi designs have been the latest in trend to make their weddings like occasions or the famous festivals more enthusiastic. Dubai ladies love the peacock patterned Dubai Mehndi design a lot. The professionals have various ideas to draw the peacock in the form of mehndi design. The best part is; each model is superior to one another. Considering one’s preference, these peacock patterns can be used in the form of mehndi tattoo design or one can decorate her hands both front and back with it. To add on, feathers of a peacock can also be drawn to give it an intricate look. Arabic mehndi designs are said to be hailed from the Middle East regions, especially the Gulf, Dubai. Right from Arabic dance to music; Arabic Mehndi has also acquired a recognized place all over the world. The wounded and woven combination of flowers, leaves, paisleys, heart shape, petals, rounds and much more has also become the mark of UAE Arabic mehndi design. These comfortable Arabic mehndi designs for your left and right hand are showcased. Dubai is known for its beauty not only regarding the place but also its Arabian people. The trend of colored mehndi; red, black and maroon also sprang up from the roots of the Gulf. By adding dyes to the mehndi, respective colors can be obtained thereby making the mehndi design look highly appealing. Just like the original henna, similar illustrations can be drawn with the colored mehndi too. A tinge of glitter will make it look breathtaking. Don’t forget to check out the look of Dubai Colored Mehndi designs. Hope you liked! So, let us know which one is your choice. Do comment us below.